Scallywags provides quality licensed care for up to 21 children between the ages of 6 weeks and five years. We can provide care for up to 30 hours per child per week. We aim to provide a warm, caring, stimulating and safe environment and to nurture each child’s self esteem through praise and positive reinforcement. Hours are 9am to 3pm Monday to Friday (except public holidays). Fees are paid per hour or in blocks. You only pay for what you use, casual bookings are welcome. 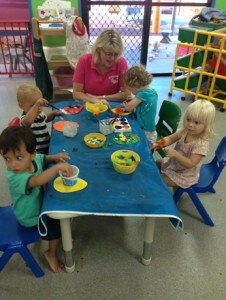 Contact the Director, Scallywags Child Care on 4946 5609 or at 14-20 Hazelwood Court, Cannonvale.